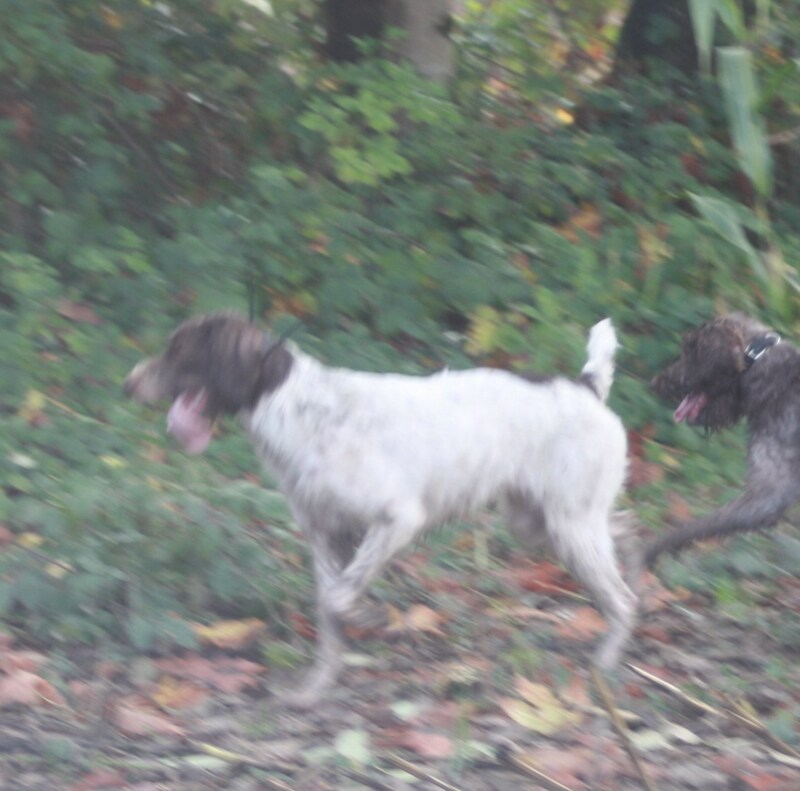 Show, Hunt, Breed – Only the best! “Missy ” NWGWP Big Guns Leading Lady is our newest addition to the pack. She is Hannah’s and Hondo’s offspring and brings the best of both to the field and ring. She is a long legged beauty with intense bird sense and drive. 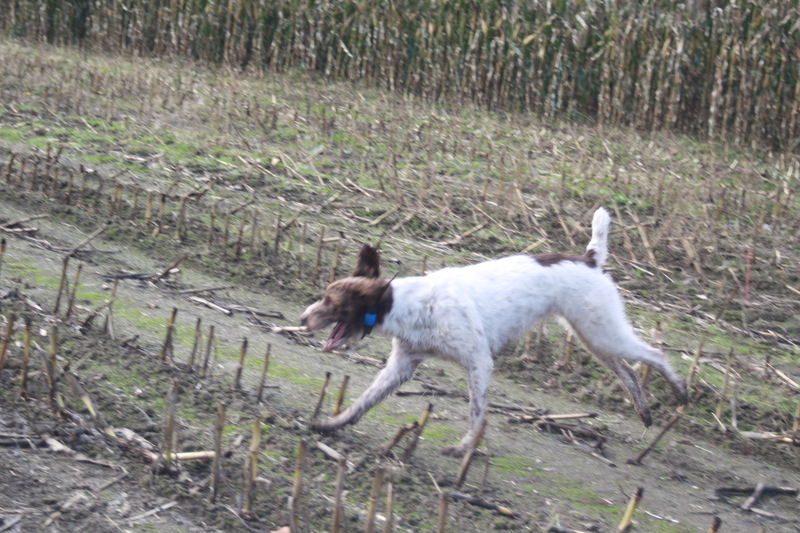 We are enjoying her in the field as she learns the ropes from the older dogs. She has earned her nickname of Mischief at home with her mischievious temperment and love of new games and challenges. She has a talent for retrieving anything left unattended ….clothes, towels, firewood, shoes, leaves, dog dishes, magazines, leashes and collars…always to hand, never damaged and with a big doggie smile and twinkle in her eyes. A natural retriever, a stylish pointer, highly competitive and eager in the field but a gentle and happy companion in the home. She is everything we’d hoped for from that litter. Is a German Wirehair Pointer Right for You? The breed originated in Germany in the late 1800s. The goal was to develop a wire-coated, medium sized dog that could be used for hunting, work both feather and fur with equal skill; retrievel; be an easily trained gun dog; be a devoted companion and pet; and be a watch dog for its owners’ family and property. In 1959, the breed was recognized by the American Kennel Club and the German Wirehaired Pointer Club of America (GWPCA) was established. GWP’s are devoted dogs that crave human companionship, doing best in a home where they are permitted a very warm, close relationship with “their people.” They do not make a good kennel dog, nor a dog that lives all its life in a backyard with little human contact. Wirehairs serve as companions who’d rather work alongside their owner all day then sleep at their owners’ feet when the day is done. Along with the intelligence and will the Wirehair possesses, the breed also has the capability to be very creative and somewhat independent. They prefer to work for who they like and will often create their own methods to accomplish their goals. They are considered a "thinking dog" and puzzle out situations. Wirehairs generally are high energy, high drive, though not “hyper,” breed and the need for a “job” is a must! This breed needs to be given meaningful work or they will invent their own assignment. These intelligent companion dogs require daily exercise and both mental and physical challenges to be truly happy and contented. These dogs are used today in hunting, agility, tracking, and as service dogs. They compete successfully in conformation shows, horseback field trials, AKC hunting tests, agility, obedience, dock dogs, and every type of performance event you can name.